Tell us about yourself; I am the mother of 3 awesome children. Annika 6, Micah 4, and Tristan 1. They keep me busy and happy. I currently went back to school after a 5 year gap. I am attending USU studying elementary education. I love to clean and organize my house, spend time with my family, get lost in a good book, work in my yard and garden, work on my tan, and support my husband in his various activities. What is your day job? I am a mother during the day, a student when I have a spare minute, and I clean the bakery at Maceys from 9pm-1am 3-4 days a week. 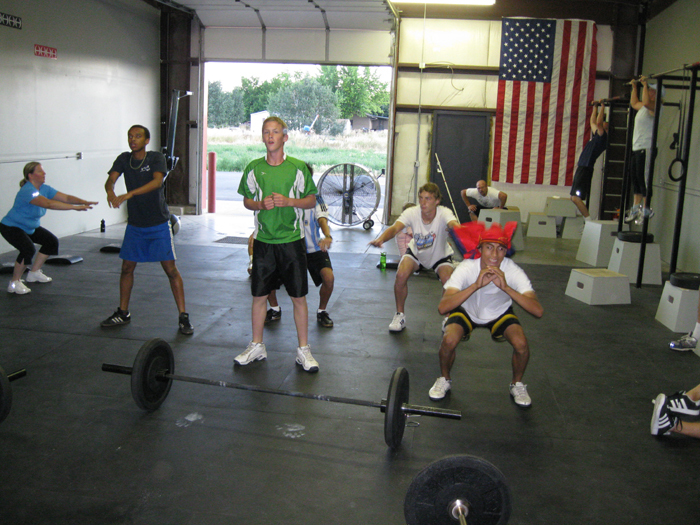 How were you introduced to CrossFit? My bff Tami Rigby wouldn’t quit talking about it! What is your favorite skill/movement that you have learned at CrossFit IoTA? My favorite skill/movement are burpees and knees to elbows. I also like the sumo dead lift high pull. Something nobody knows about me or would be surprised to know about me… I guess I’m not very exciting because the only things I could think of are: my babies have all weighed over 8 lbs, and I have been to 3 U2 concerts. How to ready todays board – If you had previously done the rookie workout, the first time posted next to your name in blue is what your first round today took you. The second time posted in blue is your total time for 2 rounds. If you have an Rx after your name, then you did pull-ups. The purple date and time was your first Rookie date and time for one round. For those of you who have been with us for over 6 weeks, we will have all of your original “Rookie” times handy. We will want you to watch the clock and make a mental note after you’re through your first round so that we can compare your score to your first day with us. It’s been just over 2 months that we have been open and we’ve seen progress and want you to see it too! 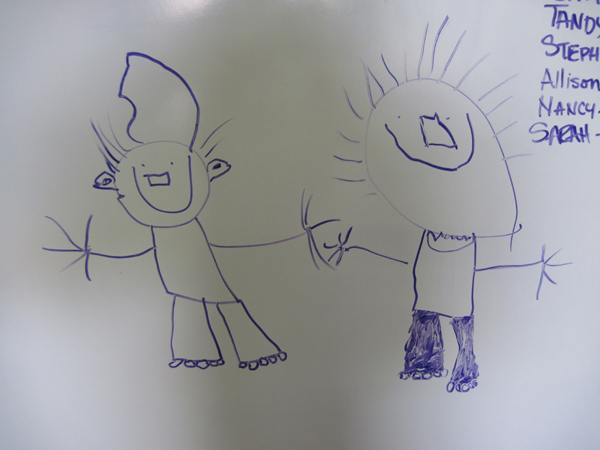 Some of the GOOD STUFF that appears on our white board!! Note: Rx weight for males is 95lbs and for females it’s 65lbs. 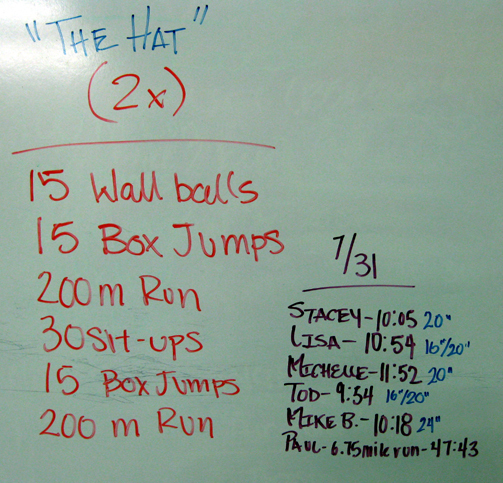 The fastest time by a male at the sections where this WOD was created was done at a BLAZING 3:53! Here is the video From the Event! HAPPY BIRTHDAY TINY errrr TYLER!! One of our members has reached the ripe old age of 27 😉 Tylers willingness to work hard and be dedicated has inspired may of us! Get to know Tyler as he is one of the “good guys”!! Keep up the great work. Tyler owning the ring row! 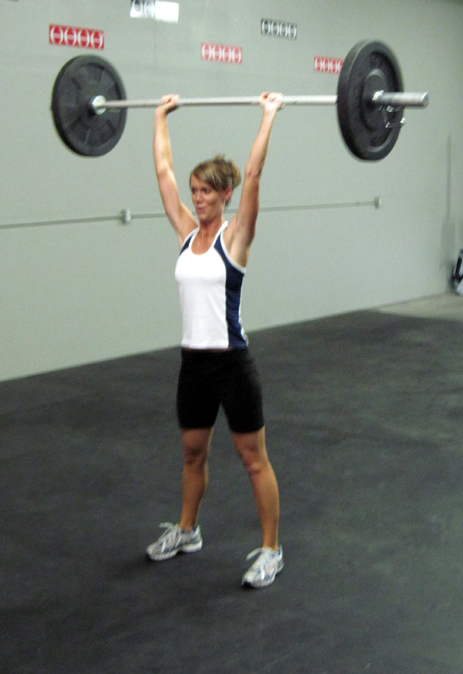 Taryn is a CrossFitter up in Canada who writes a blog about her CrossFit experiences called “Tabata This”. The following essay came from her post at the beginning of July. I thought it was good enough to post the entire thing right here on our blog. Thanks Taryn for your contribution to the CrossFit community in your beautiful writing! We all fight on the rubber matted battlefield together. Puddles of chalk dust cover the rough terrain, and bodies lay sprawling throughout the trenches when the battle is done. But is that battle really over? We pack up and march home, only to wake up and start all over again. We’re not fighting for our countries, we’re not fighting for a name, or anyone else. We’re fighting for ourselves. Half way through the battle, our hands are covered in blood, we’re drenched with sweat. The look upon our faces spells pain and defeat, but it’s what happens at this point that is the most important to ourselves and to making that advance on the rubber matted battle field to get ahead of our opponent – whether that be someone else, or simply just our mind. A friendly reaches across and pats you on the back encouragingly. “I’ve got your back,” they say. 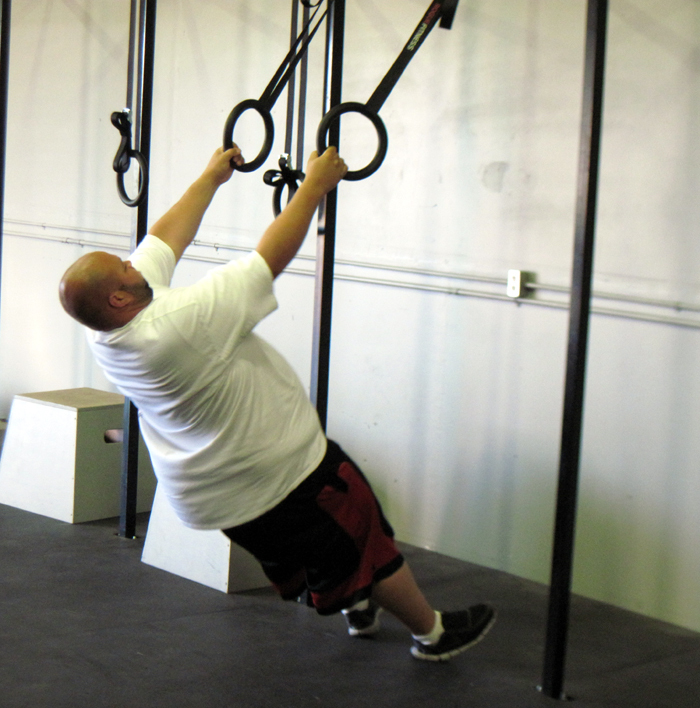 “Pick up that bar and get going. Finish it up.” Your hands hurt; they’re torn and bleeding. Your muscles feel like you’re caught in barbed wire. Standing up is like climbing a mountain with all your gear on. There’s no way you can go on. You tell yourself just to give up; throw that bar down and walk away. Tomorrow is another day. But that’s the thing. Tomorrow isn’t just another day. You either survive today, or you don’t. It’s at this point when you need to stare that bar down and attack it. Pull yourself up and over the others laying sprawled on the battlefield, and keep going. Grip the bar with that madness I know is deep down inside of you. Shut your mind off, because the ONLY thing that matters is what you’re about to do. What you’re about to do RIGHT NOW. Tomorrow doesn’t matter. Yesterday especially doesn’t matter. Getting that bar up is the ONLY thing that matters RIGHT NOW. Next time you’re struggling through the middle of your WOD, keep your hands on the bar and look into it. Leave everything on the floor. The only thing that matters is what you do TODAY, RIGHT NOW. This “drive” to reach toward new heights, faster times, and greater loads is what makes us unique as a CrossFit community. Belive it or not strength coaches have put a name to this phenomenon, overreaching. Overeaching is the intermediate between going to the gym sitting down on a recumbent bike and reading your favorite magazine and overtraining to the point of detriment. Overreaching is the point where we see favorable adaptations in: strength, metabolic conditioning (aka cardio), skill development, etc. The number one cure for overtraining is REST! Max Mormont from So Cal Strength and Conditioning/Crossfit Balboa says, “There’s no such thing as overtraining, just under recovery”. 2 – Consider your environmental workload as well (if your job has you stressed out, it can contribute to your physical stress amplifying it). 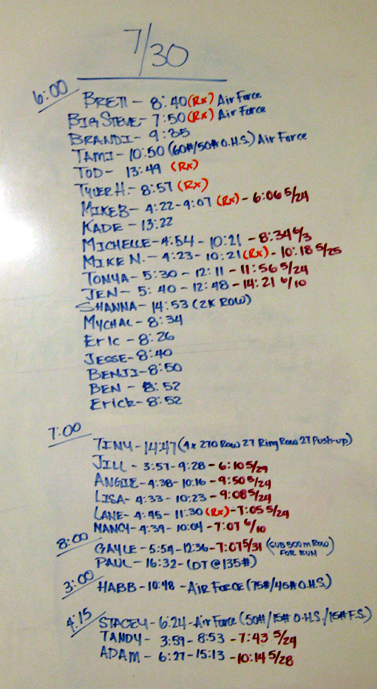 3 – Record Keeping – Make sure you are recording your times, reps, weights and sets for all WOD’s. This will help keep you keep that balance between overreaching and overtraining. 4 – Thoughtful programming – Doing WOD’s that are long (ie 15+ min) day after day will have an overall negative impact on your conditioning, but don’t worry, we have this part covered for you. 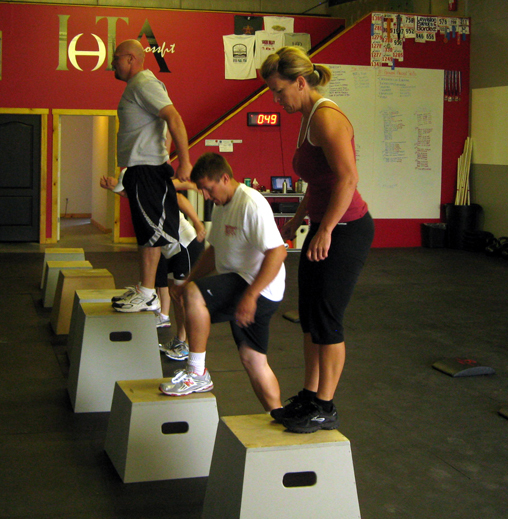 Coach Brett will be programing this week and we are looking forward to some great WOD’s!! Here is an amazing video that really captures what CrossFit is. I hope you all feel the same.